The Penang Langkawi ferry service offers daily departures between George Town on Penang Island (Pulau Pinang) and Kuah on Langkawi Island (Pulau Langkawi). These fast (high-speed) boats are operated by "Langkawi Ferry Services". They operate a fleet of passenger ferries that connect Langkawi to Penang and to Kuala Perlis and Kuala Kedah on the Malaysian mainland. They also used to operate boats from Penang to Medan in Sumatra, Indonesia, but these trip are now cancelled. The trip by boat between Penang and Langkawi is scheduled to take two hours 45 minutes. However, you may find it often takes a little bit longer depending on the weather conditions. If you want to take a much shorter boat trip, you can easily travel up the coast by bus or train to the ports of Kuala Kedah or Kuala Perlis. How much does the boat from Penang to Langkawi cost? As from 1st April 2013, a Penang Port Tax of RM 10 (RM 6.30 for all Children) has been added to the above fares. Each passenger has to pay the tax for either departure or arrival in Pulau Pinang. There are quite a few ticketing agents behind Fort Cornwallis (just head for the Queen Victoria memorial clock tower). This is also the place you have to go to catch the boat and is called Swettenham Pier. Just search for - Penang to Langkawi and that will bring up the ferry prices. 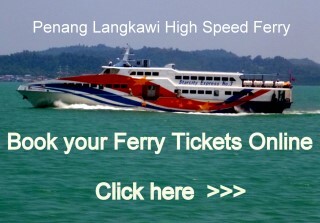 If you want to book ferry tickets from Langkawi to Penang - put in "Jetty Langkawi" - then Penang. Take along some food and drink for the trip as there is nothing available on the boat! One thing you should know before you go. These high-speed boats have a habit of making quite a few people seasick, so if this is you, you may want to take a look at flying between the two islands as an alternative. It's not that much more expensive if you can book in advance. There are also two other ports along the north-west Malaysian coast where you can catch a ferry to Langkawi island. The boat trip is much shorter and much cheaper! If you are arriving in Penang for the first time by boat, the port is just a 10 minute walk away from most of the hotels and guesthouses or you can jump in a taxi for about RM 10 (agree on a price first). If you need to catch a bus to other parts of the island, the Jetty bus terminal is less than 5 to 10 minutes walk away. Just turn left as you come out of the Penang Ferry Terminal and walk along Weld Quay until you see the bus station on the left - you can't miss it! The bus station is in front of the jetty for the ferry over to Butterworth on the mainland. This is one of the main bus terminals on Penang Island and you can get a RapidPenang bus from here to anywhere on the island.